Pro Tools | Digital Production Partnership Update Broadcast Delivery Specs - What Does It Mean? Digital Production Partnership Update Broadcast Delivery Specs - What Does It Mean? The UK based Digital Production Partnership (DPP) have updated their unified UK delivery specs for all UK broadcasters. The v5.0 spec includes changes to the audio spec, tightening both the live and prerecorded delivery specs for loudness to bring them into line with the EBU R128 standard, which is already causing concern with sound supervisors especially with regard to the live delivery spec. Loudness Required R128 delivery only – PPM acceptable for new commissions. Audio Line Up Required New 16 channel version of BLITS for UHD programmes. Either version can be used on HD. Broadcasters receive many complaints about unclear dialogue. Remember the audience has not seen the programme many times before transmission and has not seen a script. The audience does not usually have “broadcast quality” audio reproduction equipment. It is the responsibility of the producer to ensure that dialogue is clear, easy to hear and to understand by a first-time viewer who is using consumer equipment. I think this section is very interesting as it clearly points the responsibility where it should lie, with programme producer and flags up the key point that I have been banging on about with the various 'mumblegate' sagas, like Happy Valley after which we asked "BBC Sound Problems Continue - Why?" and "Loudness And Intelligibility In TV Drama - Some Answers Perhaps?" and more recently SS-GB and led us to ask "Is It Time To Add Subtitles To Parts Of TV Drama Shows?" It refers to the key issue in my eyes that "the audience has not seen the programme many times before transmission and has not seen a script" and "to ensure that dialogue is clear, easy to hear and to understand by a first-time viewer who is using consumer equipment". It rightly does NOT put the blame at the door of the audio professionals involved which is very refreshing to see, after all the crap that has been spouted in the UK press recently. This is the area that is causing the most debate, especially amongst the sound supervisors who are mixing live or 'as live programmes. Until now the DPP spec allowed a tolerance of ±2LU which gave mixers some space to maintain the dialog anchor level close to -23LU whilst retaining the energy on other elements of the show. Rob Ashard has made just this point in our interview with him. Also in my conversations with Jake Knott who mixes programmes like Judge Rinder and Jeremy Kyle, the need to have that extra slack is really important. Personally I don't think this issue is constrained to live programming, if you look at my analysis of Planet Earth 2 and The Grand Tour where I asked "Are TV Mixes Becoming Too Cinematic?" it seems that more and more broadcast mixes are ending up with the dialog level around 3 or 4LU down to accommodate the extended sections of music. One sound supervisor has found only today that trying to mix an "as-live' programme to the new ±1LU means that the dialog level is much lower than he would like to the extent that he is now finding he will need to recalibrate his monitors. Surely this is wrong? When the DPP spec came out I praised them for living in the real world and setting tolerances of ±1LU for pre-recorded programmes and ±2LU fro live shows. This tolerance gae mixers some space to work with and to help live shows retain the sense of energy of being live that they surely deserve. Loudness Range of Dialogue - Dialogue must be acquired and mixed so that it is clear and easy to understand - Speech content in factual programmes should aim for an LRA of no more than 6LU. A minimum separation of 4LU between dialogue and background is recommended. I am of the opinion that an LRA of 18LU is way too wide for any content being delivered into a normal domestic environment, on the grounds of listening environment ambient noise and the quality of the equipment being used in people's homes as well as the size of rooms too. I would prefer an LRA recommendation of 12LU rather than 18LU. 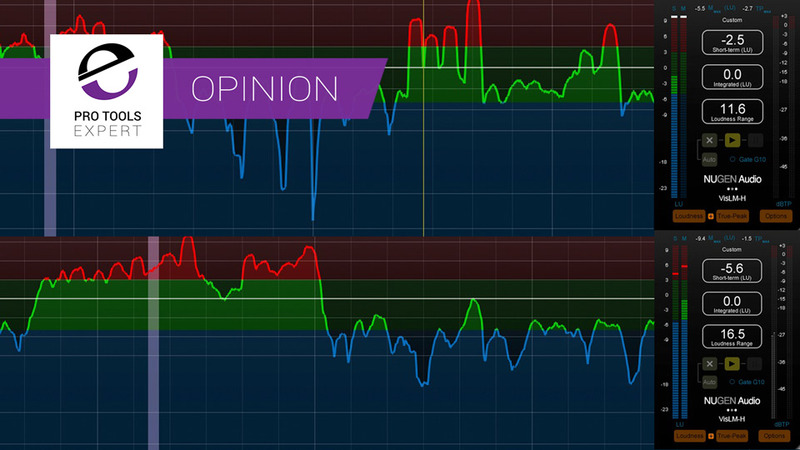 Please do share your thoughts about this, especially if you of the opinion that the new tighter specs for integrated loudness are a good thing.